Most city planners ascribe to the goal of fostering “healthy cities,” yet determining the best way to translate this vision into reality has posed a challenge given competing priorities like job creation, housing development, and access to transit. Popular planning concepts such as smart growth, new urbanism, and sustainable development often do not fully address key community health concerns like quality-of-life issues and health hazards posed by existing and proposed development. Environmental conditions and land use patterns contribute to chronic health problems such as obesity, diabetes, hypertension, and asthma. Urban development that unfolds in an inequitable manner and that fails to consider public health exacerbates these problems. Often neighborhoods that have been historically overburdened by sources of toxic pollution like freeways and factories are targeted for redevelopment projects that do not adequately account for the health hazards that existing land uses pose to current and future residents. As a result, residents of these neighborhoods may contend with planning processes that neglect to address pressing community health concerns in priority-setting, implementation, and evaluation. Our work in the arena of planning for environmental health aims to strengthen the evidence base that makes the case for public health as a pillar of truly sustainable urban development. We provide technical assistance to community-based groups and coalitions in assessing the community health impacts of proposed planning and development on issues ranging from freight transport and climate action planning to housing affordability. With our partner the West Oakland Environmental Indicators Project, we researched best practices in incorporating community health into Community Benefits Agreements to inform the redevelopment of the Oakland Army Base adjacent to the Port of Oakland. 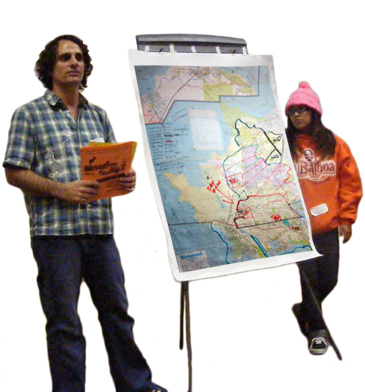 With our partner the Oakland Climate Action Coalition, we developed detailed recommendations for advancing community-based adaptation-planning priorities that protect the health of communities most vulnerable to climate change impacts via the City of Oakland’s Energy and Climate Action Plan process. We have also provided technical support to the Richmond Equitable Development Initiative on housing affordability models such as forming a Community Land Trust to ensure accessible homeownership opportunities for local residents. For more information about our Planning for Environmental Health work, please contact Catalina Garzón, Program Director, at cgarzon(at) pacinst.org.